Good Eats in my Hometown — Notorious M.L.E. In Concord there is a very good Taqueria called La Soledad. Over there you can get amazing tortas. The sassy waitress who will tell you that white people looooooooooooooove sour cream is just a bonus. I think my favorite part though is the neighborhood. There is a Vietnamese business a few doors down. The night we were there they appeared to be arguing, since none of us are Vietnamese fluent it was hard to know. Apparently the taqueria people thought they were arguing to because one lady was screaming "Callete chinos!" to hilarious effect. I love the futility of screaming "Shut up Chinese people" in Spanish to Vietnamese men. Ahhhhhh... diversity! Next door is a place called "Latino cuts" The syntax is beautifully vague. Do you get a Latino haircut or does a "Latino" cut your hair? Is there somebody named "Latino" there to do hair-cutting? What happens if "Latino" is not at work that day? Does "Filipino" cut your hair? 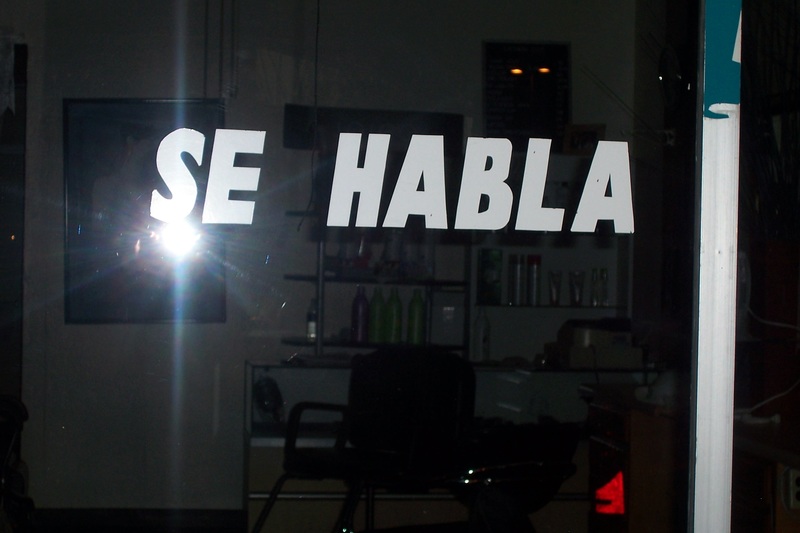 Even better the door has this sticker that says "se habla". Unfortunately they don't seem to specify what it is that is spoken, they don't promise English or Spanish, just speech. Next time you're in Concord check it out, it's behind Fry's. Posted on May 26, 2008 by La Emily and filed under Bossy Pants Recommends and tagged Food.